Conserve paper: Put a stop to unsolicited mail. Did you know Americans receive 5 million tons of junk mail every year? You can contact companies directly or you can try companies like catalogchoice.org and DMAchoice.org. Also, make sure you are using both sides of your paper, especially for taking notes and for scratch paper. By doing this, you don’t need to waste as many trash bags throwing the mail away and you save on paper you use at your house. Wrap wisely: Americans use 40 million tons of wrapping paper every year! Instead of going for the paper, try using newspapers as paper. And instead of boxes, decorate food containers (like an oatmeal container) or shoe boxes. Some people even use fabrics to wrap gifts and reuse them each year, like a one-time investment. Also, keep bows and ribbons and reuse them. This saves you money on buying wrapping paper and other supplies. 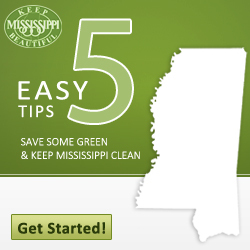 Collect rainwater: We are lucky in Mississippi to get a good bit of rain. So, why not save some of that rain and use it to water your plants? Try out a rain barrel at your house. While you do have the one-time costs, over time, you can lower your water bill by using what nature provides. Clean with cloth: Paper towels can be pricy. So, why not buy cheap cloth rags that you can wash and reuse. This saves paper and your trip and time going to a store to purchase paper towels. Compost food scraps and coffee grinds: Food waste doesn’t have to go into a landfill. Much of it can be composted and used to help your plants grow strong. Put a pail under your sink where you can place your vegetable and fruit clippings, eggshells and coffee grinds. Each day or two, empty them into a compost pile and eventually you’ll have the perfect fertilizer.